Fleetwood Mac has always been a band with an evolving lineup. Its latest iteration, however, might just be its most interesting. 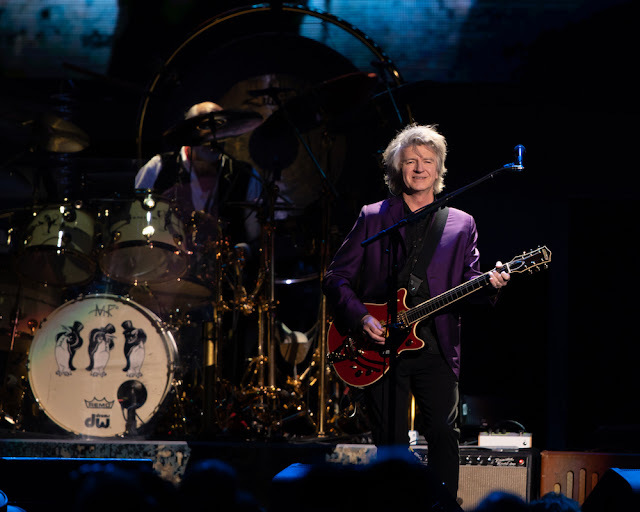 A recent announcement of a split with on-again-probably-off-forever guitarist Lindsey Buckingham came with the news that Finn, 60, would be joining the band. 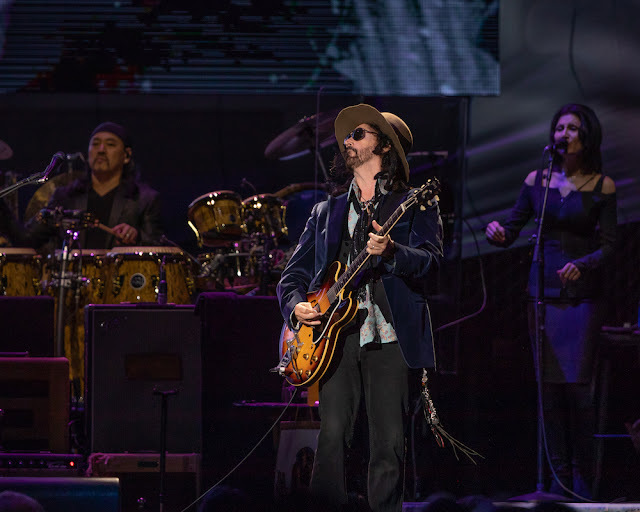 The same announcement declared that Florida guitarist Mike Campbell — who made a name for himself as the right hand man for late Gainesville legend Tom Petty — had also punched his ticket to Mac-dom (an encore cover of Petty’s “Free Fallin’ was especially poignant). For better or worse on Monday night, 45 minutes is also about how long it took to truly make the viability of these all-star new additions seem like a good idea in practice. To be fair, early set sound issues were to be expected. 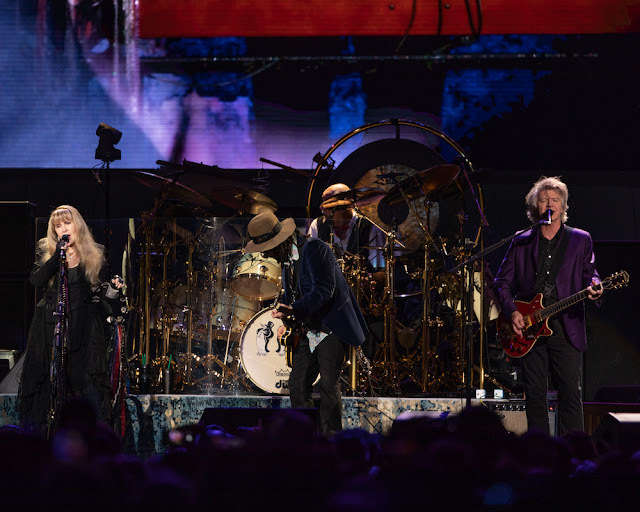 It was just the eighth show of the second leg of Fleetwood Mac’s current tour, after all. Sure, it was disheartening to hear Taku Hirano’s shaker more clearly than McVie’s vocal on “Little Lies,” but that would surely be corrected. Finn — who looked spiffy with perfectly feathered hair and a luxe, amethyst-tinted suit coat — would definitely figure out that he sang with a little too much volume on “Second Hand News.” Campbell, a spry 69 years old, would soon realize that the singular (albeit righteous) tone he deployed on all those songs was getting boring at a rapid pace, right? McVie seemed to be asking for some kind of monitor adjustment during “Everywhere” — the set’s seventh song — and she, sadly, never truly recovered throughout the more than two-hour, 22-song performance. 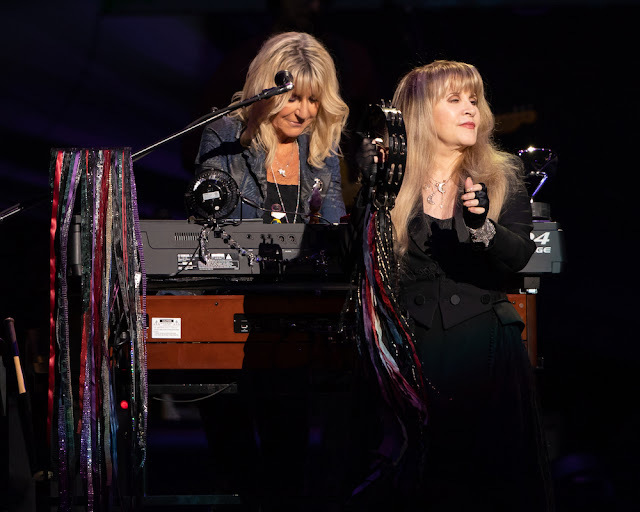 Things started to turn for the band as a whole, however, when Hirano’s chimes sounded right before Stevie Nicks launched into “Rhiannon.” Campbell, with a cream-colored Telecaster in hand, was patiently, and perfectly, working through the song’s classic riff, and a sense of calm, quiet self-assuredness took over the stage as the world’s favorite gypsy spread her arms wide to close the number. The Stevie Nicks effect is well known. You should have seen the doppelgangers in a crowd of 17,000. Still, it’s hard to describe what it feels like to watch the 70-year-old rock and roll queen do her thing. Nicks’ presence eventually took hold of Finn, who harmonized flawlessly on “Gypsy,” and she took some time during the Mirage highlight to walk over to Campbell, play air guitar and then slowly twirl away. I melted, and I wanted to be her — or at least be Campbell, who also seemed to be under the spell. Hell, the former Heartbreaker even ended up relinquishing the solo on a jaw-dropping version of “Landslide” to the band’s other Neale (Heywood). A great call, since the 21-year veteran of The Mac understood the subtlety that song requires. And speaking of subtlety, how about that Mick Fleetwood? The set opened with cameras presenting a tight shot of his kick pedal beating out the intro to “The Chain,” and his heavy sticks would propel the band he co-founded for the duration of the evening. He and Hirano, 45, even got to play all by themselves for what felt like a 10-minute percussion solo during “World Turn.” Fleetwood’s wide-eyed grin is infectious. Never before in the history of old Englishmen has one enjoyed his job — and being alive — more. There is, as fans know, not much that is subtle about the 71-year-old. If Nicks draws us in with her veiled mysticism, then Fleetwood is the joyous Wreck-It Ralph telling everyone how happy he is while doling out hugs at a maddening pace. His energy is endearing, and it’s something that I’ve seen countless young rock and pop acts attempt to translate onstage with about a fifth of the effectiveness. Something happens when you survive more than 50 years of bandom. Something even more special occurs when that band is is Fleetwood Mac. Monday night’s set proved that in spades, and while tours like these often feel like twilight cruises, you can’t help but hope that this lineup will take another victory lap. Fans will surely wait for that — no matter how long it takes.